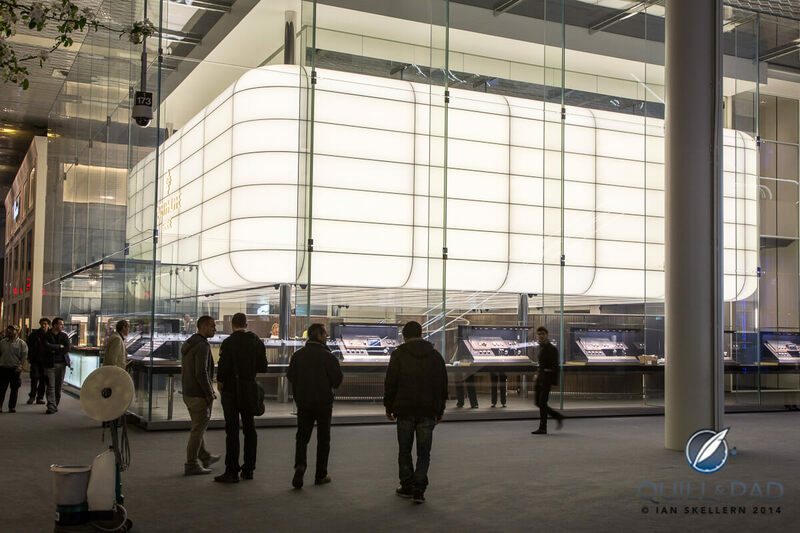 At Baselworld 2013, the new layout of the halls and structure of the booths, particularly in Hall 1.0, were very big news. This was naturally because of the restructuring of Baselworld itself, which was completed just before the fair began in April. Read more in my article on Forbes about last year’s new booths at New Architecture At Baselworld Includes Hermès, Rolex, TAG Heuer Booths. Entering the main hall, it was immediately apparent that every brand was proudly at home in a redesigned booth. Every brand except Patek Philippe, that is. The Geneva-based icon was still in the Basel stand it first erected in 1999, the eve of the fair grounds’ last restructuring. If you have been following Patek Philippe for a while, you’ll know that this is not a brand to make quick decisions or follow the herd. Patek Philippe is rooted deep in Swiss history and always seems to do things a little differently than anyone else. 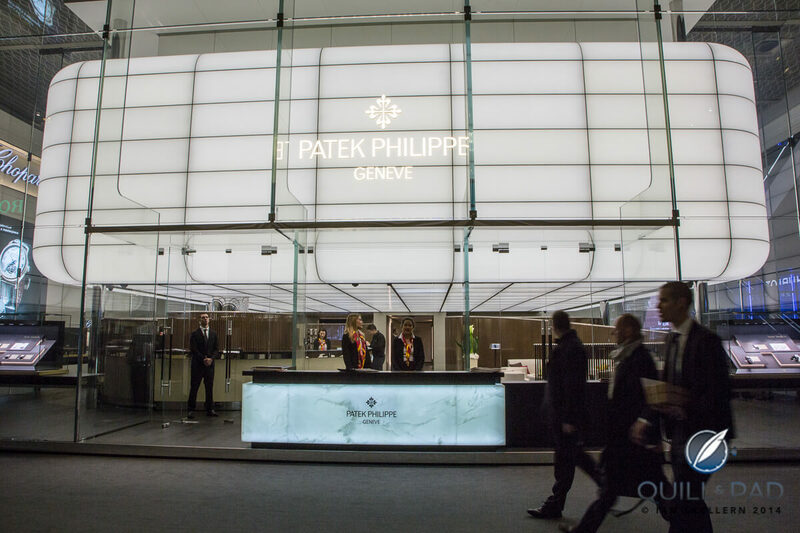 And so it comes that Patek Philippe’s booth makes for big news at both the 2013 and 2014 fairs: last year for not having been upgraded, and this year for being the only brand in Hall 1.0 to debut a brand-new, chic structure designed by a big-name architect. Patek Philippe marks its presence in Hall 1.0 in a very special way: with a luminous, transparent structure designed by star architect Ottavio di Blasi & Partners in Milan, who also designed TAG Heuer’s new booth from last year. Futuristic and functional at the same time, the new Patek Philippe booth remains in the same key location at the crossroads between Halls 1.0, 1.1 and 2.0. This pavilion serves two important purposes: as an outward window providing passersby with a look at the new watches on display and as a protective shield for the serious business being conducted inside. Though the location is the same, the total usable area has increased more than 50%, from 955 m2 to 1,500 m2 thanks to an additional level third level. The enlarged booth accommodates 16 outward-facing showcases with room for 125 watches and 50 calibers, 12 sales rooms, three press rooms, three conference rooms (one with enough room to seat 50 people! ), three kitchens, a bar, a restaurant for the staff, offices, plus technical and storage space. As before, the front part of the booth decked out in flecked maple wood, rosewood, and bronze-finished brass invites visitors to rest their feet or have a look at some of the rare handcrafted timepieces on display in a dedicated space measuring 35 m2. The interior decoration is very welcoming, and fully in line with Patek Philippe corners and boutiques found all over the world. Ottavio di Blasi’s team was inspired by the concept of English conservatories when creating this fascinating new structure, which comprises 117 glass elements weighing 70 tons and 125 tons of steel. The central structure is made of 400 m2 of backlit acrylic polymer combined with five kilometers of LED strips, transforming the construction into a grand pavilion of light. The luminous structure is truly a fitting a harbinger for the brand’s illustrious 175th anniversary this year. But don’t look for any celebratory anniversary watches within just yet – there aren’t any. Those are to be seen and heard much later this year at a dedicated event. For more information, please visit www.patek.com and www.baselworld.com.